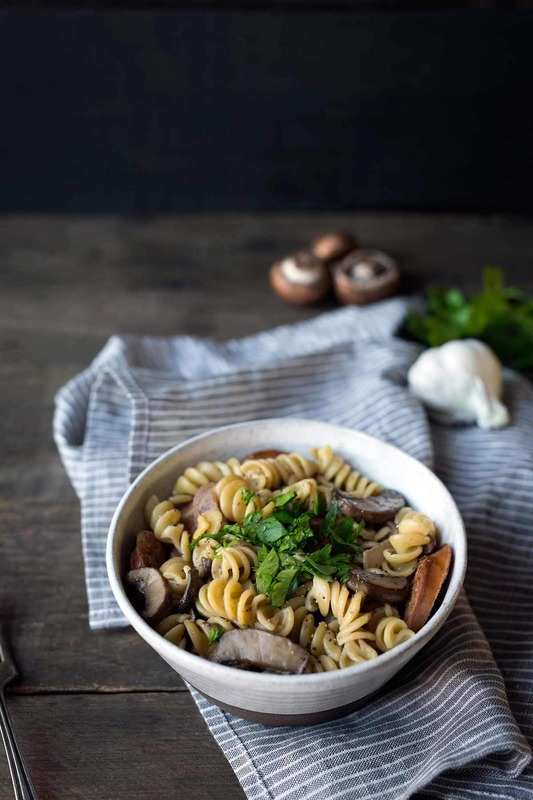 Creamy sausage mushroom pasta is a fabulous, hearty dinner perfect for any night of the week! It’s a new favorite around here, and as soon as you try it, you’ll know why. 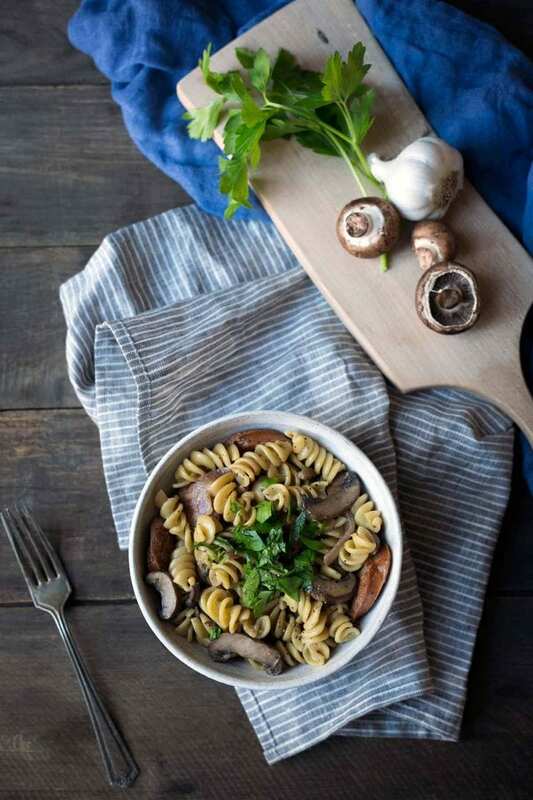 This scrumptious, savory mushroom pasta recipe is easy to modify based on the ingredients you already have, and it reheats well, making it an excellent option to enjoy throughout the week. I love a flexible, forgiving dinner option that can be thrown together in mere minutes from pantry and refrigerator staples. I’ve recently been making this mushroom pasta for Jeff and I quite a bit. What I love about this pasta with mushrooms is that it has so much room for creativity. I’ve got a whole slew of suggestions below! If you’re trying to more get comfortable branching out from recipes as written, pasta is the perfect place to experiment. I’ve offered a couple mushroom suggestions in the ingredients list, but any variety will work here. If you’re trying to decide what to purchase from the store, keep in mind that regular button mushrooms have the least amount of flavor. Yellow onions, vidalia onions, and shallots will all work in this recipe. Even red onions will work. Use what you have. If you plan to serve a white wine with the pasta, that’s a great choice for using in the recipe itself since it will create a natural flavor pairing. Don’t use a sweet wine, but something mildly citrusy is ok, like a New Zealand Sauvignon Blanc. A dry chardonnay is almost always a safe choice. If you don’t consume alcohol, it can be omitted entirely. I realize not everyone wants cream in their dinner. You can absolutely omit the cream to lighten things up, instead tossing the ingredients with a bit of the pasta water at the end. If you still want creaminess, try substituting half-and-half, whole milk, or 2% milk. You can swap out the smoked andouille for your favorite type of sausage (for example, Italian and chorizo sausage work very well). You can also lighten things up with a turkey or chicken based sausage. I’m a fan of the Wellshire Turkey Andouille Sausage, which I can usually find at Whole Foods. It adds a lot of flavor with fewer calories. If you’re swapping the smoked sausage for a raw variety, the easiest way to prepare it is to bake the sausage in the oven at 400 or 425 degrees F for around 20 minutes, using tongs to flip the sausages halfway through. 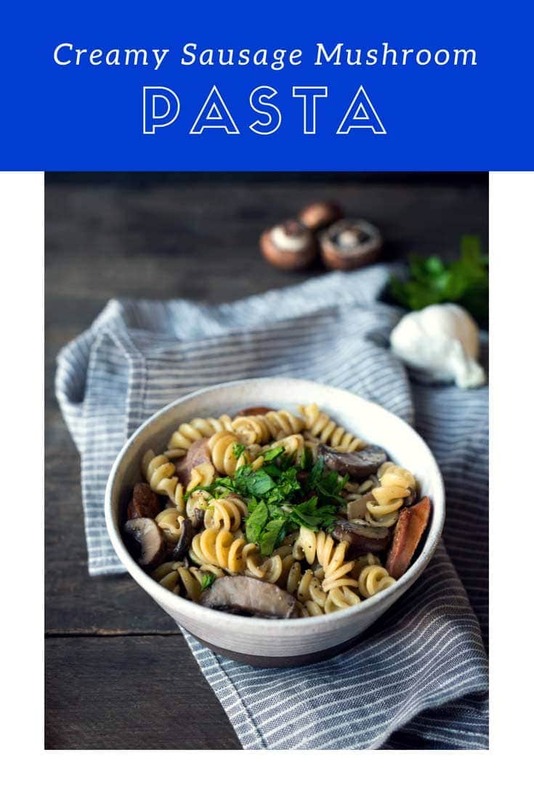 I’ve made this mushroom pasta recipe a few times without the chicken stock, simply deglazing the pan with water as needed. It’s a cozy dinner that comes together quickly! Check out my Cacio e Pepe, Lemon Garlic Parmesan Linguine, and Fettuccine with Vegan Alfredo Sauce! 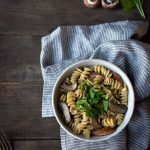 This creamy sausage mushroom pasta is an easy, hearty dinner perfect for any night of the week! Pair it with your favorite tossed salad for a complete meal. Bring a large pot of salted water to a rolling boil. Add the pasta and cook until al dente, approximately 10 minutes. Drain, rinse briefly and transfer to a large bowl. While the the pasta is cooking, heat the olive oil over medium heat in a large Dutch oven or heavy bottom saucepan. Brown the sausage on both sides, in batches if necessary to avoid overcrowding the pan. Remove the sausage from the pan and set aside. Turn the heat down to medium-low. If the bottom of the pan seems dry, add an additional 1/2 - 1 tablespoon of olive oil. Add the onions along with a pinch of salt and cook for several minutes until they are soft, stirring periodically, then add the garlic and cook for an additional 1-2 minutes. If at any point the bottom of the pans begins looking like it’s going to burn, add 1-2 tablespoons of water and scrape the brown bits back into the onions and garlic. (note: brown bits are good; black bits are bad.) After the garlic has cooked, add the mushrooms and cook until they're caramelized and have slightly reduced down in size, 3-5 minutes. Add the white wine to the pot and use a spatula to scrape up any brown bits and incorporate them back into the vegetables. Once the liquid from the wine has reduced almost completely, add the chicken stock. Turn the heat up to medium, and allow the liquid to reduce down by about half. Add the mushroom mixture along with the liquid from the pan to the pasta bowl, along with 1 tablespoon cream. Toss everything together until evenly combined, seasoning with salt and pepper to taste (I used 1/2 teaspoon each of salt and pepper). Toss in the additional tablespoon of cream if desired. Serve pasta topped with a healthy sprinkling of chopped parsley. If you plan to serve white wine with the pasta, that's a great choice for using in the recipe since it will create a natural pairing. Don't use a sweet wine, but something citrusy is ok, like a New Zealand Sauvignon Blanc. A dry chardonnay is almost always a safe choice. If you don't consume alcohol, it can be omitted entirely. Love healthy one pot meals! I’ve been craving mushrooms so much lately, need this pasta in my life! Love easy meals like this. and I LOVE mushrooms.